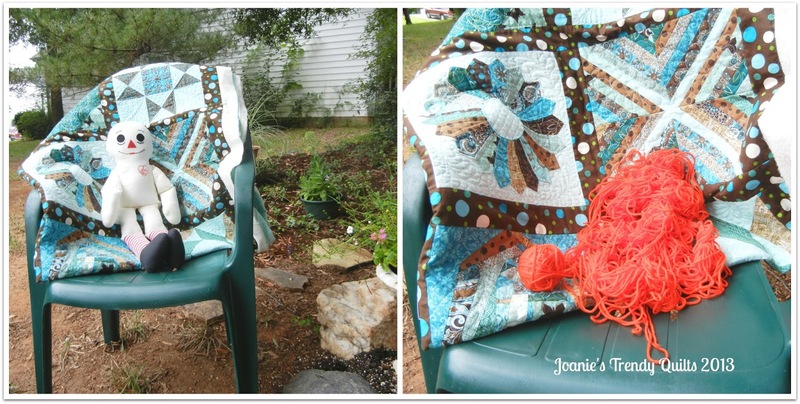 Joanie's Trendy Quilts : Oh My Goodness the Cat Got in the Dryer!! First I want to share with you my latest finish on free motion quilting the Balkan Puzzle Block. I am loving the end results. Parts of the design was improvisational free motion quilting and parts was with the help using Golden Threads Quilting Paper since blue or white marker wouldn't show up on the light brown pieces in the block. I wanted this to be finished last evening but tiredness set in. Amazing what a night's rest will do for you. I woke up and began thinking about getting this block done. But first had to go make a pot of coffee. I hope you have a cuppa as you read through. How do you like my favorite polka dot coffee cup? Sometimes hubby wakes before me and makes the coffee. The day before I completed the 5 Sided Wonky Block. 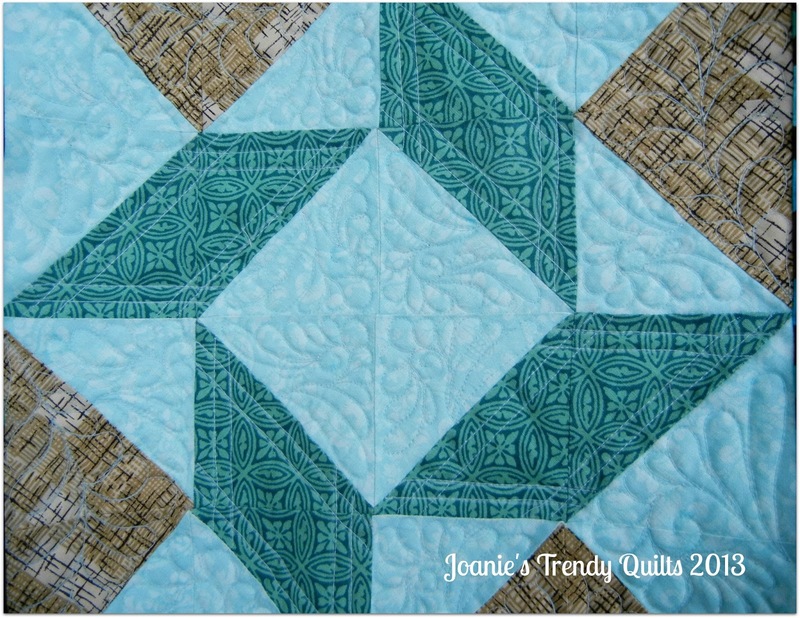 Admittedly not one of my favorite blocks but it still was fun to make when following the Craftsy Block of the Month 2012 series. Anyways back to the block - it is free motion quilting with wrapping feather plumes around the center. The corners are cross hatched! As you can see I am making progress with making Raggedy Ann! Well sort of! It looks like a cat found a ball of yarn and had fun batting it around! I will now fess up! I do not have a cat and there wasn't a cat in my dryer! Truth be known in an effort to hurry up the drying process of washing a skein of yarn I threw it in the dryer. I couldn't find an end piece so I had to cut to create one in order to begin unsnarling Raggedy Ann's hair. I was sitting in bed doing the untangling until hubby finished up working (he works at home and always comes in the door saying the best part of my day is walking down the hall to my 2 pretty gals and one is a dog). It was his Friday as we say here and was quite tired and was anxious for the lights to go out while I was in the admidst of untangling. I gave it up as I rather not have a grumpy hubby the next day due to being sleep deprived. 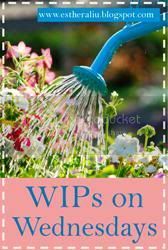 Linking with WIPS on Wednesdays - On Esther's Blog her WOW! is making a shirt with a pattern she has made. 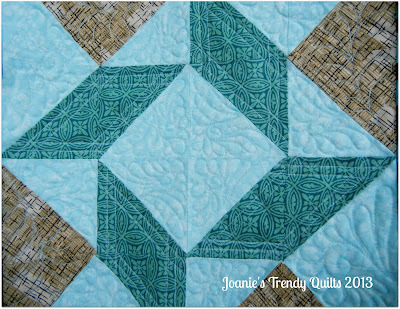 At Freshly Pieced Lee is featuring "Shush I am Quilting." Each Icon below will link to the perspective blog. Hope to see you there! Thanks for stopping by. 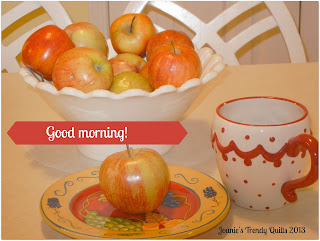 I hope your day is joyful! 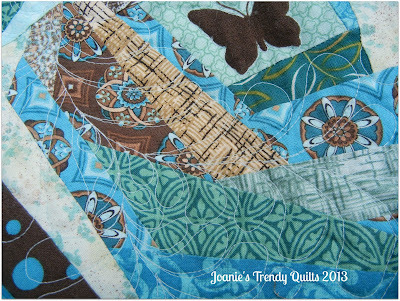 Love the colours and what I can see of the rest of the quilt. Beautiful. Hello Ainwick! The aqua, chocolate and green make for an interesting combo of colors. Though I have to admit I am looking forward to working with different colours. Thanks so much for stopping by and leaving a comment. I attempted to send you a message but no email. I love the colors, and the wonky block is may favorite too! I love the colors of these blocks. The brown with the aqua is so calm. Your FMQ looks great too! I love that quilt and your quilting is so fancy! That yarn is a mess! My hubby and I joke that people at the yarn factory hide knots in the yarn for kicks. This goes way beyond that though. Good luck!